Carbon and nitrogen stable isotope analysis of bone collagen is now an almost routine method in the study of ancient diets. By stable isotope analysis it is possible to determine directly the type of diet of an individual and, consequently, of a population group. Therefore, at regional levels, the similarities and differences in the diet of individuals within an entire population can be easily detected (Katzenberg, 2000). This paper is a preliminary report of a more complex study, still in course, of 25 individuals from the Basilica of San Domenico Maggiore in Naples (15th–17th centuries) (Fornaciari, 1999, 2006) and of 20 individuals from the Medici Chapels of the Basilica of San Lorenzo in Florence (16th–17th centuries) (Fornaciari et al., 2007). The sample of the Basilica of San Domenico Maggiore includes famous people such as the Aragonese Kings Ferrante I and Ferrante II, Queen Giovanna IV, and the Marquis of Pescara Ferdinando d’Avalos, who won, in 1525, the battle of Pavia against the French King Franc¸ois I. On the other hand, the sample of the Medici Chapels includes the Grand-Dukes Cosimo I, Francesco I and Ferdinando I with their families and some children. Isotope analyses were performed by Arthur C. Aufderheide (University of Minnesota) and by Carmine Lubritto (2nd University of Naples). First, I need to outline the underlying principles and methods involved in the isotopic dietary reconstruction. What are atoms, ions and isotopes? An atom is defined by the number of protons in its nucleus; for example, a carbon atom has six protons, while a nitrogen atom has seven and an oxygen atom has eight. The mass of an atom is determined by the sum of protons and neutrons, each having a mass of one atomic mass unit. The mass of an electron is negligible and does not contribute to the overall mass of an atom. Therefore, a carbon-12 atom, with atomic mass of 12, has a nucleus containing six protons and six neutrons, with six electrons surrounding the nucleus of the atom. Variation in the number of neutrons in the nucleus of an atom produces atoms of the same element, which differ by mass; these are known as isotopes. Isotopes can be either stable, such as 12C, 13C, 14N and 15N, or radiogenic, such as 14C. Radiogenic isotopes decay at a set rate and, as a result, measurement of the 14C/12C ratio is the underlying principle behind radiocarbon dating, since the original isotopic ratio and the rate of decay are known constants. For dietary reconstruction, it is the stable isotopes that are of interest, since the relative quantities of the stable isotopes do not change over time and, as a result, stable isotope ratios in the archaeological bone will reflect the stable isotope ratio at the time of death, providing that diagenetic (soil) alteration has not taken place. What is fractionation? Chemically, all isotopes will react in the same way, whether stable or radiogenic. However, the difference in mass between the isotopes means that chemical reactions and physical processes will sometimes discriminate against the heavier isotope in an attempt to preserve energy; this process is called fractionation. An example of this can be seen in the evaporation and precipitation of water (H2O), resulting in changes in the isotopic ratio of oxygen (18O/16O) at the different stages of the water cycle. During evaporation, the lighter oxygen isotope (16O) will be the first to be incorporated into the water vapour cloud, meaning that the oxygen stable isotope ratio of rainwater differs from that of ocean water. This process of fractionation also takes place in biological systems, meaning that ratios of the stable isotopes of carbon (13C/12C) and nitrogen (15N/14N) will vary between plants, animals, humans and other members of a local dietary system. For carbon stable isotope analysis, this standard is a marine carbonate, PceDee Belemnite (PDB), where the isotope values are higher: for this reason delta 13C is negative. For nitrogen, the standard is atmospheric nitrogen (air), where the isotope values are lower: for this reason delta 15N is positive. The system makes small differences in isotopic ratios between samples much easier to identify and quantify. Feeding experiments have shown that d13C and d15N values in the organic protein portion of bone (collagen) are directly related to dietary intake and can be used to examine the contribution of specific dietary components (Ambrose, 1993; DeNiro &Epstein, 1978; DeNiro&Epstein, 1981; Schoeninger & DeNiro, 1984). These d13C and d15N values are passed along the food chain in a relatively predictable pattern. Determination of the d13C and d15N values in archaeological human and animal bone collagen makes it possible to reconstruct the local dietary systems and to interpret human diet and subsistence patterns. Differences in carbon stable isotope values can be used to examine the importance of what are called C3 and C4 plant food species. This categorization refers to the production of either a three- or four-chain carbon molecule during the early stages of photosynthesis. C3 plants, with more negative d13C values, include temperate species, such as the native European species of wheat, barley, oats, rye, fruit and vegetables, while C4 plants, with more positive d13C values, are adapted to more tropical environments and include some of the imported domesticated species, such as maize, millet, sorghum and sugarcane. 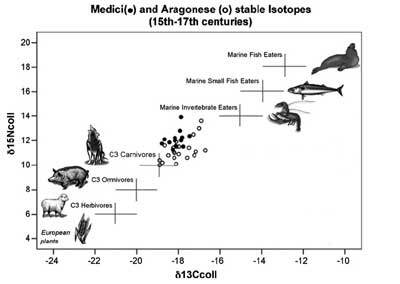 Stable isotope ratios can also be used to examine trophic levels, since there is a shift of approximately +2–4%in nitrogen and +0.5–l% in carbon between the bone collagen of an organism and its consumer. As a result, both d13C and d15N values gradually increase along the food chain from plant species with low d13C and d15N values through to herbivores, carnivores and super-carnivores with increasingly more positive d13C and d15N values. Dual analysis of d13C and d15N values enables an examination of the role of marine foods in diet, since marine ecosystems have more positive d13C and d15N values than terrestrial ecosystems (Chisholm, Nelson, & Schwarz, 1982; Schoeninger, DeNiro, & Tauber, 1983). Any contribution from marine food in an individual’s diet would therefore result in an increase in both the d13C and d15N values of bone collagen. The first use of stable carbon isotope measurements to solve an archaeological problem was the study of the introduction of maize agriculture to eastern North America (Bender, Baerreis,& Steventon, 1981; Buikstra & Milner, 1991; Katzenberg, Saunders, & Fitzgerald, 1993; van der Merwe & Vogel, 1978; Vogel & van der Merwe, 1977). Eastern North America is a C3 environment and human skeletons from this region before the adoption of maize agriculture have C3-derived isotopic signals in their bone collagen, around_21.5%.Maize, as a C4 crop, has an isotopic composition quite distinct from indigenous foods. After the introduction of maize agriculture, d13C of human bone collagen rose steeply, reaching more positive than_12%values. This change occurred only ca AD 1000, much later than many archaeologists had thought. In this study a C4 plant like maize, imported from America, as well as millet and sorghum (not consumed by the wealthy Renaissance classes) can be easily ruled out. High values of d15N, at the level of carnivores, demonstrate a diet that was very rich in meat (Fig. 1). d13C values are in keeping with an integration of fish, especially for the Aragonese series from Southern Italy. d13C and d15N ratios well correlate (C = 0.40*; S < 0.02), again confirming a large intake of marine fish. Moreover, recent studies have demonstrated that the proportion of marine proteins in dietary protein intake can be estimated by linear interpolation using the bone collagen d13C value: d13C values close to _20% indicate a diet with almost no (<5%) marine proteins, and d13C values close to _12% indicate a diet of almost 100% marine proteins (Richards & Hedges, 1999). On this basis fish integration of the diet can be estimated at 14–30% for the Medici and at 12– 40% for the Aragonese (Fig. 2). Comparison with Upper Paleolithic big-game hunters reveals a similar level of d15N, showing an equivalent intake of animal proteins (meat) (Richards, Pettitt, Stiner, & Trinkaus, 2001). Contrary to the Renaissance princes, Upper Pleistocene hunters show no correlation between d13C and d15N ratios (C = 0.24 n.s. ), revealing absence of marine protein consumption. Fig. 1. The values of d15N are very high, at the level of carnivores, attesting a diet rich in meat. 40% for the Aragonese (white circles). Italian neolithic agriculturalists reveal a minor level of d15N, showing a lower intake of animal proteins (Giorgi, Bartoli, Iacumin, & Mallegni, 2005; Le Bras-Goude et al., 2006). Agriculturalists show no correlation between d13C and d15N ratios (C = 0.35 n.s. ), revealing no marine protein consumption. The Romans of York show a level of d15N very similar to the Renaissance Italian princes, revealing a strong intake of animal proteins (Mu¨ldner & Richards, 2007). d13C and d15N of the Romans strongly correlate (C = 0.41**; S < 0.001), revealing a large marine integration of the diet. The Anglo-Saxon sample of York reveals a high level of d15N, approaching the level of animal proteins of the Renaissance princes (Mu¨ldner&Richards, 2007). However, the Anglo-Saxons show no correlation between d13C and d15N ratios (C = 0.22 n.s. ), revealing absence of marine protein consumption. The medieval inhabitants of York show a high and very similar level of d15N, with a strong intake of animal proteins (Mu¨ldner&Richards, 2007). Ratios of d13C and d15Nof York are strongly correlated (C = 0.62**; S < 0.001), revealing a high consumption of fish. correlated (C = 0.83**; S < 0.001), with a significant consumption of sea fish. The late-medieval British sample of the Augustinian Friary atWarrington reveals a high and very similar level of d15N, with a strong intake of animal proteins, at the same level of the Renaissance princes (Mu¨ldner & Richards, 2005). Ratios of d13C and d15N strongly correlate (C = 0.71; S = < 0.001). This trend demonstrates a high consumption of fish.Comparison with a post-medieval sample fromYork (Fig. 3) reveals a high and very similar level of d15N, again with a strong intake of animal proteins (Mu¨ldner&Richards, 2007). The ratios of d13C and d15N are strongly correlated (C = 0.83**; S < 0.001), showing a significant consumption of sea fish. The 19th century Birminghaminhabitants also reveal a high level of d15N (Richards, 2006). Ratios of d13C and d15N are strongly correlated (C = 0.58**; S < 0.001). This trend reveals a considerable consumption of marine proteins. A possible test of the method is its application for some historical figures (Fig. 4). Isotopic connections (highlighted by rectangles), well evident in married couples (Cosimo I and Eleonora di Toledo, Francesco I and Giovanna d’Austria, Ferrante II and Giovanna IV, Luigi and Caterina di Moncada) or brothers (Giovanni e Garzia, sons of Cosimo I), are the obvious consequence of people living in the same ‘‘alimentary environment’’. The most ‘‘carnivore’’ couple (left arrows) are the Grand Duke Francesco I de’ Medici (1541–1587) and his wife Giovanna d’Austria (1548–1578), while the Southern Italy couple Luigi di Moncada (1614–1672) and his wife Caterina (+1659) – together with Ferrante d’Avalos (1530– 1571) – show the diet richest in fish (right arrows). With regard to this result, it is important to remark that Luigi Moncada and Francesco d’Avalos were both viceroys of Sicily, and the peculiarity of the Sicilian alimentation, with its abundance of valuable sea fish, is the most probable explanation. d’Avalos (1530–1571) – shows the diet richest in fish (right arrows). This investigation into the diet of the Renaissance wealthy classes in Italy demonstrates the potential of studies on carbon and nitrogen stable isotope analysis in archaeology, and in particular the advantage of studying material from the same period. The Italian Renaissance princes had a much wider choice of food than other classes (Grieco, 1999). For this reason their diet should not be considered typical of the wealthy class as a whole, in the same way as the isotopic data observed in the population groups sampled for this study may not be representative for all the groups of the elite Italian society. Historical records reveal that after meat and wine, which constituted the central nucleus of the nobles’ diet, eggs and cheese also appear, although much less frequently (Riera- Melis, 1999). These two types of food, with high protein content, were combined with meat on normal days and alternated with fish on penitential occasions. In the aristocratic dietary regimen, vegetables occupied a secondary place, with almost total absence of fruit (Grieco, 1999). 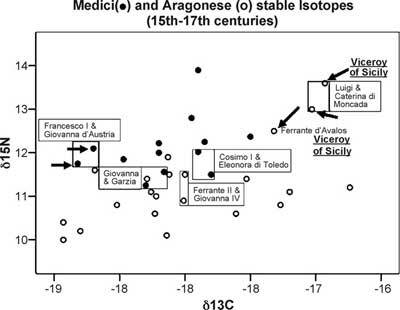 However, the isotope values reported here are remarkably similar to those published for other late Medieval and post-Medieval populations in England. Our results clearly reflect the large intake not only of meat but also of marine foods by the Italian aristocratic classes, especially from southern Italy, in the 15th–17th centuries. Other foods high in proteins and enriched in nitrogen, such as freshwater fish, birds (and their eggs), or molluscs are likely to have provided smaller contributions. Given the large variety of dietary resources attested by historical documents this conclusion can hardly be surprising. This is most probably a countrywide phenomenon, but more isotope data are now needed to put these findings into context. Adherence to Medieval fasting regulations has long been suggested as the main reason for this dietary change (Mu¨ldner&Richards, 2005, 2007). As a matter of fact, the number of fasting days in the Church calendar varied throughout the Middle Ages. However, in the Renaissance and Modern age, meat was usually forbidden on Fridays and Saturdays, on the eve of important feasts, and during the Lent and Advent periods. All together, these fasting periods equalled one-third to half the days of the year. Finally, in those days fish was the most important source of proteins among the wealthy classes (Montanari, 1999a, 1999b; Woolgar, 2000). 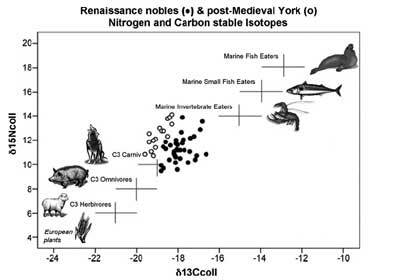 The Italian Renaissance isotope data, together with other series from Northern Europe, clearly show that this significant dietary habit was caused by the greatly increased consumption of marine fish in the late Medieval period, and we can argue that this was primarily motivated by the fasting regulations imposed by the Church. In conclusion, the stable isotope data may well reflect the influence of religious beliefs on the dietary habits of a population group. Ambrose, S. H. (1993). Isotopic analysis of palaeodiets: Methodological and interpretative considerations. In M. K. Sandford (Ed. ), Investigation of ancient human tissue (pp. 59–130). Reading, Gordon and Breach Science. Bender, M. M., Baerreis, D. A., & Steventon, R. L. (1981). Further light on carbon isotopes and Hopewell agriculture. American Antiquity, 46, 346– 353. Buikstra, J. E., & Milner, G. R. (1991). Isotopic and archaeological interpretation of diet in the Central Mississippi Valley. Journal of Archaeological Science, 18, 319–329. Chisholm, B. S., Nelson, D. E., & Schwarz, H. P. (1982). 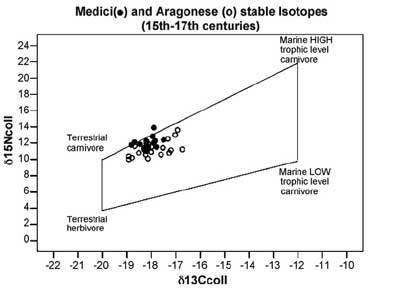 Stable carbon isotope ratios as a measure of marine versus terrestrial protein in ancient diets. Science, 216, 1131–1132. DeNiro, N. J., & Epstein, S. (1978). Influence of diet on the distribution of carbon isotopes in animals. Geochimica et Cosmochimica Acta, 42, 495– 506. DeNiro, N. J., & Epstein, S. (1981). Influence of diet on the distribution of nitrogen isotopes in animals. Geochimica et Cosmochimica Acta, 45, 341– 351. Fornaciari, G. (1999). Renaissance mummies in Italy. Medicina nei Secoli, 11, 85–105. Fornaciari, G. (2006). Le mummie aragonesi in San Domenico Maggiore di Napoli. Medicina nei Secoli, 18, 875–896. Fornaciari, G., Vitiello, A., Giusiani, S., Giuffra, V., Fornaciari, A., & Villari, N. (2007). The Medici Project: First anthropological and paleopathological results of the exploration of the Medici tombs in Florence. Medicina nei Secoli, 19, 521–544. Giorgi, F., Bartoli, F., Iacumin, P., & Mallegni, F. (2005). Oligoelements and isotopic geochemistry: A multidisciplinary approach to the reconstruction of the paleodiet. Human Evolution, 20, 55–81. Grieco, A. J. (1999). Food and social classes in late Medieval and Renaissance Italy. In J. L. Flandrin &M. Montanari (Eds. ), Food. A culinary history from Antiquity to the Present (pp. 302–312). New York: Columbia University Press. Katzenberg, M. A. (2000). Stable isotope analysis: a tool for studying past diet, demography, and life history. In M. A. Katzenberg & S. R. Saunders (Eds. ), Biological anthropology of the human skeleton (pp. 305–327). New York: Wiley-Liss. Katzenberg, M. A., Saunders, S. R.,&Fitzgerald,W. R. (1993). Age differences in stable carbon and nitrogen isotope ratios in a population of prehistoric maize horticulturalist. American Journal of Physical Anthropology, 90, 267–281. Le Bras-Goude, G., Binder, D., Formicola, V., Duday, H., Couture-Veschambre, C., Hublin, J. J., et al. (2006). Strate´gies de subsistance et analyse culturelle de populations ne´olithiques de Ligurie: approche par l’e´tude isotopique (d13C et d15N) des restes osseux. Bulletins et Me´moires de la Societe´ d’Anthropologie de Paris, 18, 43–53. Montanari,M. (1999a). Peasants, warriors, priests. Images of society and styles of diet. In J. L. Flandrin & M. Montanari (Eds. ), Food. A culinary history Fig. 4. Isotopic connections (highlighted by rectangles) in married couples (Cosimo I and Eleonora di Toledo, Francesco I and Giovanna d’Austria, Ferrante II and Giovanna IV, Luigi and Caterina di Moncada) and in brothers (Giovanni e Garzia, sons of Cosimo I). The most ‘‘carnivore’’ couple (left arrows) are the Grand Duke Francesco I de’ Medici (1541–1587) and his wife Giovanna d’Austria (1548–1578), while the Southern Italy couple Luigi di Moncada (1614–1672) and his wife Caterina (+1659) – together with Ferrante d’Avalos (1530–1571) – shows the diet richest in fish (right arrows). G. Fornaciari / Appetite 51 (2008) 10–14 13 from Antiquity to the Present (pp. 178–185). New York: Columbia University Press. Montanari, M. (1999b). La fame e l’abbondanza. Storia dell’alimentazione in Europa. Roma-Bari: Editori Laterza. Mu¨ldner, G., & Richards, M. P. (2005). Fast or feast: reconstructing diet in later medieval England by stable isotope analysis. Journal of Archaeological Science, 32, 39–48. Mu¨ldner, G., & Richards, M. P. (2007). 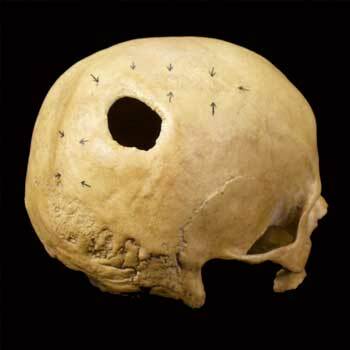 Stable isotope evidence for 1500 years of human diet at the city of York, UK. American Journal of Physical Anthropology, 133, 682–697. Richards, M. (2006). Palaeodietary reconstruction. In M. Brickley, S. Buteux, J. Adams, & R. Cherrington (Eds. ), St. Martin’s uncovered. Investigations in the churchyard of St. Marin’s-in-the-Bull Ring, Birmingham, 2001 (pp. 147– 151). Oxford: Oxbow Books. Richards, M. P., & Hedges, R. E. M. (1999). Stable isotope evidence for similarities in the types of marine foods used by late Mesolithic humans at sites along the Atlantic coast of Europe. Journal of Archaeological Science, 26, 717–722. Richards, M. P., Pettitt, P. B., Stiner, M. C., & Trinkaus, E. (2001). Stable isotope evidence for increasing dietary breadth in the European mid-Upper Paleolithic. Proceedings of the National Academy of Sciences of the United States of America, 98, 6528–6532. Riera-Melis, A. (1999). Society, food and Feudalism. In J. L. Flandrin & M. Montanari (Eds. ), Food. A culinary history from Antiquity to the Present (pp. 251–267). New York: Columbia University Press. Schoeninger,M. J., DeNiro, M. J., & Tauber, H. (1983). Stable nitrogen isotope ratios of bone collagen reflect marine and terrestrial components of prehistoric human diet. Science, 220, 1381–1383. Schoeninger, M. J., & DeNiro, M. J. (1984). Nitrogen and carbon isotopic composition of bone collagen from marine and terrestrial animals. Geochimica et Cosmochimica Acta, 48, 625–639. van der Merwe, N. J., & Vogel, J. C. (1978). 13C content of human collagen as a measure of prehistoric diet in Woodland North America. Nature, 276, 815–816. Vogel, J. C., & van der Merwe, N. J. (1977). Isotopic evidence for early maize cultivation in New York State. American Antiquity, 42, 238–242. Woolgar, C. (2000). Take this penance now, and afterwards the fare will improve. Seafood and late medieval diet. In D. J. Starkey, C. Reid, & N.
Ashcroft (Eds. ), England’s sea fisheries: the commercial sea fisheries of England and Wales since 1300 (pp. 36–44). London: Chatham.